Recently, my friend and Balaton colleague Gillian Martin-Mehers organized a Balaton Group Book List. The list contains 124+ books by Balaton Group members. Founded by Dana Meadows and Dennis Meadows more than 30 years ago, the Balaton Group brings together scientists, teachers, consultants, writers, and practitioner to debate and learn in an atmosphere, with the highest academic standards, free of political and economic pressures. While the focus of this book list is quite diverse — from general books focused on “thinking about systems” to more specific books focused on water, energy, culture, money, climate, new business and community models, use of educational games, folktales and more — they all share a common focus on systems thinking, systems dynamics and sustainable development. 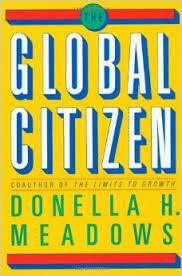 My all-time favorite — Dana Meadow’s Global Citizen –i s here of course. In her warm yet direct style, Dana invites us all to see the world as an interconnected system, of which we are all part and for which we are all responsible.